"Help us o lord, to penetrate into the secret of the child so that we may know him, love him and serve him according to thy laws of justice and following they divine will." 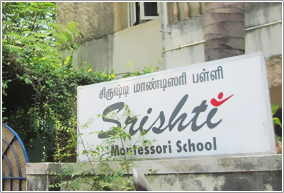 Srishti Montessori school was started in June 1995 to provide the right type of education for children between 2 ½ and 6 years. The school has adopted the Montessori approach to education for its sound educational principles. 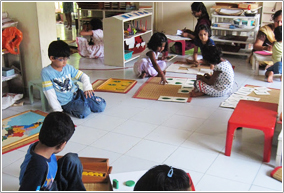 It is run by Prathima Muralidhar who holds a International Diploma in Montessori studies awarded by Association Montessori Internationale, an organisation founded by Dr. Maria Montessori in Netherlands. It offers spacious environment for children to work and learn through exploration. The stimulating environment helps the children to actualise their latent talents and achieve their full potential. Value based education, introduction of our culture through celebration of festivals, personal attention and close monitoring of the child’s progress are the special feature of the school. Srishti owes its success to the encouragement of the parents who are convinced that the 3 year Montessori programme offers meaningful education to their child. Dr. Montessori believed that no human being is educated by another person. People teach themselves. A truly educated individual continues learning long after the hours and years spent in a classroom because he or she is motivated from within by a natural curiosity and love for knowledge. She felt therefore, that the goal of early education should not be to fill children with facts from a pre-selected course of studies, but rather to cultivate their own natural desire to learn. Her experiments made the child the centre of education, her program is adapted to the interest and needs of children. As a result, children concentrate with enthusiasm and achieve a real and profound understanding of their work. This intellectual progress is accompanied by emotional growth. The children become harmonious in movement, independent in work and helpful with one another. We at Srishti are happy to follow this wonderfully conceived thought of Maria Montessori. Montessori is education...not a nursery school. The best time to start a child’s education is during the early years... 21/2 to 3 years when most of the child’s intelligence and social characteristics are formed. 50% of the child’s mental development occurs before 4 years of age. At srishti your child will learn to think in logical patterns and to deal with reality. Our goals is to stimulate children develop emotionally, intellectually, physically towards their full potential. We want children to have the freedom to learn at their own pace in an atmosphere of respect and understanding. 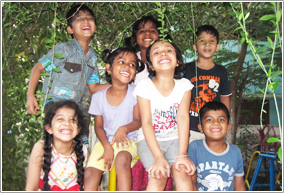 Srishti helps children to develop themselves in a contemporary and conducive atmosphere through a process of facilitation. The Montessori method was developed by Dr. Maria Montessori, who was a well known educationist and whose training and experience was broad based and remains unique even today. Her approach to education was scientific and her discoveries were verified through observation and experimentation. According to her, the process of education begins at birth and continues throughout life. Montessori is a philosophy and method of education which emphasizes on the potential of the young child and which develops this potential by employing specially trained teachers and using special teaching materials. The child possesses an unusual sensitivity and intellectual ability, unlike those of the adult, to absorb and learn from his environment, both in quality and quantity. The first six years of life are the most important years of a child's growth when unconscious learning gradually emerges to the conscious level.